The digital revolution is disrupting the traditional business model for small and medium businesses (SMBs). On one hand it makes it possible for them to compete with much larger companies, but on the other the investment required can be daunting. Before setting out to create a digital strategy, it helps to work through what digital transformation actually means and how that affects SMBs. When unchallenged, large companies who refine their digital strategy can satisfy needs once available only through a SMB. The traditional advantages of small businesses over corporations are personalized service and an inventory of niche products tailored to their local market. Techniques like intelligent customer profiling give companies that would ordinarily be too large to customize their offerings the insight to do so. If SMBs aren’t pushing digital transformation themselves, these large companies could steal their client base and push them out of a local market. The problem is the investment in time and resources required for traditional digital solutions. Getting maximum efficiency from daily operations like reporting, inventory, or accounting is easy to do with modern software. However, the type of programs used by corporations aren’t practical for SMBs. They’re complicated to operate, needing trained staff to maintain their databases, and the typical SMB will only use a fraction of their capabilities. To complicate the issue, large-scale software is expensive enough that recouping an investment would take too long to merit the expense. SMB managers often make do by stretching the capabilities of programs like Excel, but that can cause more problems than it solves. Analytics software inspires a similar dilemma since the rewards of data science and analytics for SMBs are hard to see. Unsure how to translate their data into actionable results, owners hesitate to invest the time and money to join the digital revolution. They worry that the potential damages from project failure are much higher for smaller businesses that can’t absorb losses like huge companies. Fortunately, software developers are beginning to cater to the digital transformation needs of SMBs. Solutions aimed at SMBs are more widely available. Owners no longer have to buy management software meant for global corporations in order to digitize their operational needs. Instead they can choose software with only the features they will use. For example, a landscaping company can have a unified dispatch and reporting app built that lets managers assign jobs and receive completion reports. The app costs less than a solution meant for larger companies and meets the company’s requirements more closely. Analytics is easier now, too. Rather than hiring an in-house data science team, SMBs can take advantage of off the shelf enterprise analytics software. This is a popular option among SMB owners. Last year SMBs used an average of 4.8 apps to manage their operations, up from 3.8 in 2015. 46% are tracking their social media metrics through analytics programs, and 47% use some level of business intelligence software. SMBs do run into trouble with premade software that doesn’t quite meet their needs. Some solve the problem by stringing together a collection of apps that each solve a different problem. 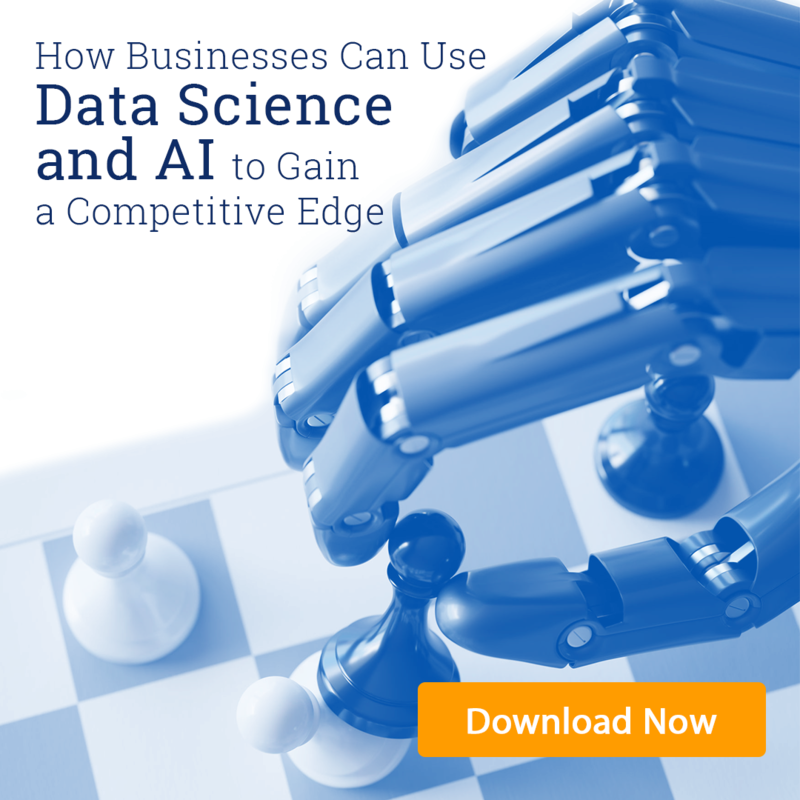 The resulting technological complexity can give the impression that data science is too complicated for SMBs, but there are good alternatives to the “patchwork app” system. Custom programming on an SMB level is surprisingly affordable. Instead of using a handful of apps to manage outcall scheduling and reporting, for example, a customized business app could combine those functions in one easy to navigate place. Cloud technologies are making many of the same analytics favored by large companies available to SMBs, too. By tracking and predicting customer needs, SMBs can implement smart inventory systems that make the most of limited shelf space. Targeted marketing is another convenient tool for reducing operating costs. It lowers the price of customer acquisition while raising the value of individual clients through repeat business. Speaking of lowering costs, data science can reduce overhead in general. Artificial intelligence and automation takes tedious or repetitive tasks out of human hands, leaving employees free for more skilled projects. The boost in efficiency makes up for SMB’s comparatively smaller staffs. In a very real sense, SMBs are better positioned to benefit from digital transformation than large companies. 41% of SMBs feel their size is an advantage when overcoming institutional resistance to adopting new technology. They have less bureaucracy surrounding the decision to change, and they have more to gain by going digital. When they do commit to digitization, their efforts have a high success rate. Three quarters of SMBs feel that gains from investing in data science technology met or exceeded their original expectations. Despite the challenges, digital strategy should be a priority for SMBs. It’s a game-changer. Half of industry leaders believe that technology levels the playing field between small businesses and large corporations. Digital transformation is the most reliable path to maximizing an SMB’s resources to gain an edge against their bigger competitors. How has the digital revolution affected your business? For advice on fine-tuning your digital strategy or to explore how to begin, get your free consultation with a Concepta expert today.